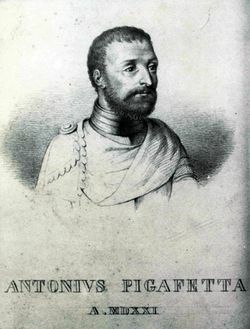 Pigafetta was born into a wealthy Vicenza family, and studied navigation among other things. He served on board the galleys of the Knights of Rhodes, and accompanied the papal nuncio, Monsignor Chieregati, to Spain. Later, he joined the Portuguese captain Ferdinand Magellan and his Spanish crew on their trip to the Maluku Islands. While in the Philippines Magellan was killed, and Pigafetta was injured. Nevertheless, he recovered and was among only 18 of Magellan’s original crew who, having completed the first circumnavigation of the world, returned to Spain on board another vessel, the Victoria. Most importantly, Magellan kept a journal of his voyage, and this is a key source for information about Magellan’s famous journey. About the diary: The version used here is The First Voyage Round the World by Antonio Pigafetta, translated by Lord Stanley of Alderley as reproduced in Wikisource. For the entries, reference has also been made to Magellan Fleet Timeline, by John Woran. Reference was also made to A Chronological History of the Discoveries in the South Sea Or Pacific Ocean by James Burney. For the purpose of providing contemporary equivalents to some of Pigafetta’s place-names, this list by Carlos Quirino was consultedl, as was Early Mapping of Southeast Asia: The Epic Story of Seafarers, Adventurers by Thomas Suarez. 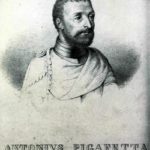 Other accessible online publications of other translations of Pigafetta can be found in Magellan’s Voyage, American Heritage, Vol. 20, Issue 6, October, 1969, and in The Philippine Islands, 1493-1898, Volume XXXIII, 1519-1522.